Apartment with 2 bedrooms, 2 bathrooms, kitchen, living room and balcony. The apartment is on the first floor of Ulivo, one of the buildings of the apartment complex Villagio Lago di Como in Aqua Seria. The floor is accessible by stairs and an elevator. The living room has patio doors with access to the balcony. 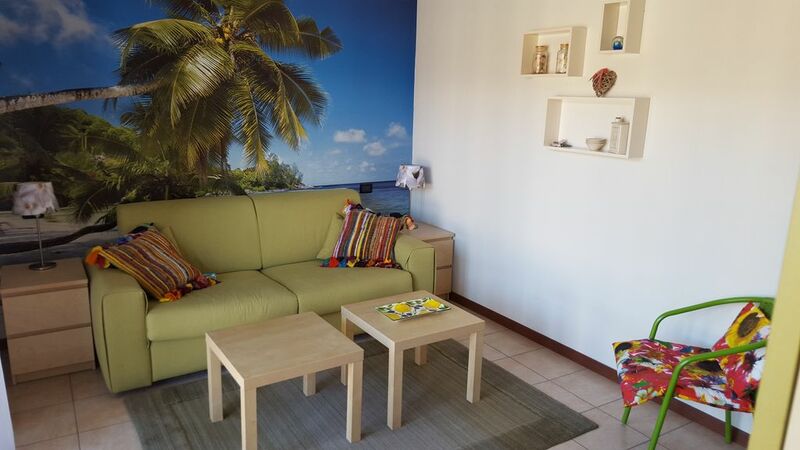 There is a comfortable sofa bed, a TV with Dutch channels (Canal Digital) and a cabinet with lots of storage. There are two bedrooms. The master bedroom has a 2-bed (160x200), a wardrobe and drawers. Double doors give access to the balcony. The 2nd bedroom has a 3-person bunk bed, which is also suitable for adults. There is a large chest of drawers available to store all clothing. The apartment has two bathrooms, one with bath, shower, sink, toilet and bidet. The other bathroom has a bath, sink, toilet and bidet. The kitchen is equipped with a lounge which offers place for 6 persons. One can use a refrigerator, hob and grill / oven. There is a Nespresso machine for a delicious cup of coffee.